Our LCA continues with Art and Design for Poverty Relief and Sustainable Development project. This is an activity of support to LCA and the Local Year Campaign at CENFACS by taking action to design an e-card (electronic-card) or p-card (paper-card) to help reduce local greenhouse gas emissions (GHGE). You can write a message on your e- or p-card. The message on your design product needs to be of motivating the locals and showing ways of making cuts in GHGE. After your design and art work done, you can post your work to us and other local people to motivate the local world on ways of helping to reduce GHGE. We thank you for your support in taking LCA and creating to help reduce GHGE. For more on this LCA initiative, please contact CENFACS. Our advocacy work on Madagascar continues by supporting the Victims of cyclone, floods and drought. Anyone who would like to Light up this Blaze of Hope with CENFACS is welcome to do so. 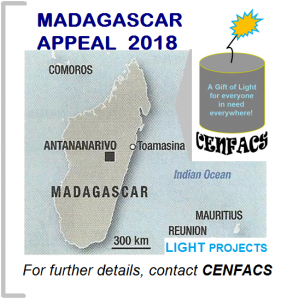 If you instead choose to support these victims otherwise while still keeping the essence of CENFACS’ Lights Appeal, please let us know as well. 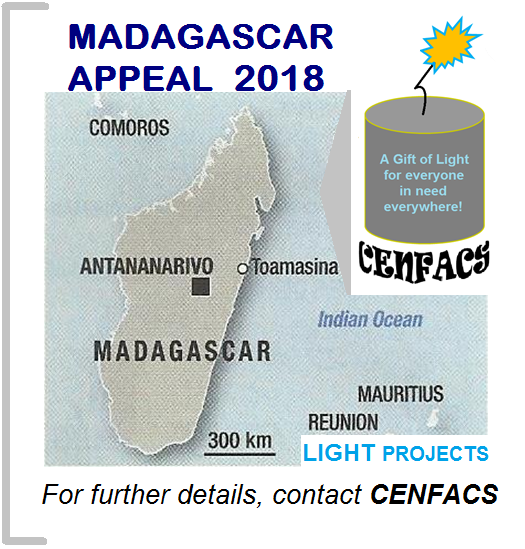 To Light your Blaze of Hope for the above Victims with CENFACS, please contact CENFACS so that we know what you are doing about this appeal. For further details about this appeal, please contact CENFACS as well. 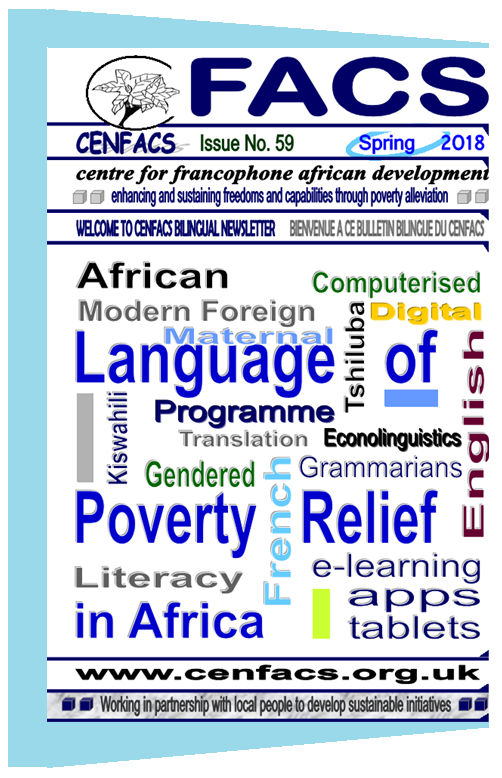 Language of Poverty Relief is the title of the 59th Issue of CENFACS’ bilingual newsletter (Spring 2018 Issue) as we informed you some few weeks ago. Please find below the key highlights and summaries about this Issue. This issue helps in understanding of language as a system for poverty relief and sustainable development. It provides some insights on how poverty can be addressed through languages and how much change we can together make in the life of the poor through languages. Languages can be used in a given context to reduce poverty. Languages can influence economic status. In a book edited by Harbert and other people, they argue that “On the one hand, poverty affects language survival… On the other hand, the languages people speak or do not speak, can influence their economic status in substantial ways, limiting or facilitating access to jobs and education and full participation in the functions of the society”. (1) Languages influence human conditions of life, including of the poor. In accordance with econolinguistics (or social science of language), language is also a system of education to help lift up the standard and help society to function. For example, (2) the need of literacy in Swahili became an objective of the colonial system according to Leonard Bloomfield (p. 128). The acquisition of social status can be assisted by the manipulation of language. In the Social Context of Language Standardisation in India, Franklin C. Southworth mentioned Bloomfield (1933: 496-7) in saying that many persons and families rose into relatively privileged positions and had to change from non-standard to standard speech. So, the way people use their language can provide them some economic and social status. The 59th Issue goes further in providing some elements on how language can be a tool for poverty relief and sustainable development. Language is a determinant factor of access to resources, assets, facilities and support. Language disadvantage and capability deprivation can reinforce other areas of disadvantages and deprivations. Language has a relieving power from poverty and hardships. For example, a good command of the four key skills of English language (i.e. reading, writing, speaking and listening) can help overcome deprivations and vulnerabilities. English is the spoken and written language in the UK. As a language of education, communication, life and work; English is the spoken and written language for both UK nationals and ethnic minorities. To comfortably and accurately express needs, both UK nationals and ethnic minorities have to use English language as a medium of communications. In this respect, language is important in human life. The importance and power of the English language are even self-explanatory for ethnic minority communities. In order for them to reduce communications poverty and other forms of poverty (such as income, consumption poverty), it is vital for them to overcome any forms of English language barriers. One can still argue that why some people speak well English but are still poor. Well, the types of poverty they experience may or may not be linked to language poverty. For them, there could be a need to find different explanations about their state of poverty and life circumstances. What is true is that we can reduce poverty by helping those whose English is not their first language to learn, speak and write with confidence in English so that they can adequately express their needs and aspirations in the society where they live and in which English is the official language. Both computerised and digital translations and human translation can be used to help reduce and end poverty. In particular, we are talking about translation (e.g. CENFACS’ Translation service) for the community in need of a language to fully function in the UK society. Translating works for those people from communities who find difficult to express their needs in English are proved to be effective in addressing the need of these communities. This is the case of the translation conducted by CENFACS to help French-speaking people and families. Although the aim of the languages projects at CENFACS is to empower people in need to communicate their needs and aspirations by themselves in their chosen languages; where they fail to do so because of language, CENFACS works with them through the learning of the English language. This enhances their integration and participation as economically active members of the UK society. Generally speaking, mother tongue or maternal language is the language that a person learns as a child at home (usually from their parents). It is the one children may use to express their basic life-sustaining needs of food, clothing, shelter, care, health, education etc. Being able to express your needs in your mother language is important in the process of poverty reduction, especially for children. Those who fail to do that can sometimes end up where many opportunities of life are denied to them. Being able to communicate in this language, in the place where it is used while you are there, can save one from trouble. This is because for some people, poverty starts when they were little and if they cannot express themselves in their first language to get those needs sorted out. Then, they may or may not end up poor as a little ones. Although the concept of gender relates to both men and women, in this 59th Issue our focus is on women’s conditions of poverty. These conditions are of access to and unequal distribution of resources, material assets, social assets, health, social networks etc. It is also the problems of: participation in decision making, recognition of the care economy, access to employment and equal pay, economic autonomy etc. This article discusses the idea whether or not language itself delays women’s empowerment in relation to these conditions. So, by talking about gendered poverty the 59th Issue would like to point out one form of poverty experienced by women. This form is through language. The Issue discusses and finds that some languages the way in which they were constructed tend to be gender biased as far as some vocabularies to address women. For example, in Latin languages the masculine tended to win over feminine when it comes to use verbs in past participle and adjectives. Women had to carry male titles as the academicians did not engender titles. There has been some efforts from some academics to change this, however there is still a long way to go for the humanity to fix the problem. One may ask a question how this can create or exacerbate poverty. Gender inequality in language can create or exacerbate gendered poverty; keeping women poor in society as the language used does not command equality and empowerment. Believe it or not, reducing gender inequality in language can lead to the reduction of gendered poverty. In this respect, there is a need to engender poverty alleviation through the improvement of languages. To improve literacy rates and inclusion; e-learning apps and tablets in literacy can help to back up off-line methods of learning. It can help exchange learning development experiences between children across the world; children who have similar needs of reducing literacy-related poverty. This can enhance the language and communication skills for and between children, as well as boosting equal opportunity for them. These ways of learning would include online digital lessons, educational resources, activities and games to support children’s learning. This can inspire and challenge’s learning ability to be creative. This kind of learning opportunity is also a chance to reduce poverty, especially child poverty. We should not forget the problem of online protection and vulnerability that the use of e-learning resources can pose. There are already online educational resources and activities to support children’s learning. Some of these resources are free. Literacy sites for kids are available on i-player and as podcasts for learning for life, poverty relief and sustainable development. Being conversationally-fluent in multi-language and able to use digital literacy apps and tablets can help children to reduce poverty and hardships. The computing and digital worlds have brought a lot of changes and opportunities for everybody including the poor people. The ability to read and write via Information Communications (IT) and digital technologies has a tremendous effect on people’s life, including the poor as well. We can use digital literacy to fight poverty. Being IT and digital literate is itself a sign of poverty relief. Likewise, being able to understand the IT and digital languages can be highly beneficial in terms of poverty reduction. Today, it is much easier to communicate with our Africa-based Sister Organisations (ASOs) via the computerised and digital languages than many years ago. This enables us to better plan together projects and programmes as well as support those lives in desperate need. Information and Communications Technology (ICT) is widely accepted as a powerful tool for poverty eradication, just as the computerised and digital languages have been recognised being effective in poverty alleviation. Although there is a digital divide between the North and the South, this divide does not stop the globalisation process of the computing and digital technologies to reach the remote areas of the globe. L’Afrique est peuplée de plus d’un milliard de personnes physiques qui parlent plus de deux milles langues. Ces langues représentent un atout majeur pour la réduction de la pauvreté. Ces moyens d’expression peuvent libérer les pauvres en Afrique et être des instruments de lutte contre la pauvreté et la précarité. Mais, il y a un problème avec ces langues. Le problème est celui-ci : comment faire que les langues africaines deviennent des vrais outils de combat contre la pauvreté. Cet ensemble de ces chantiers de travail peut faire que les langues restent et, si elles ne sont pas, deviennent celles de réduction de la pauvreté. Nos collègues africains peuvent planifier des projets dans ces domaines. Si ces projets existent déjà, c’est mieux. S’ils n’existent pas ou s’ils sont confrontés au problème de financement, alors des efforts peuvent être déployés pour trouver le financement nécessaire. There is always a debate over the way in which any language is written and spoken; whether or not a language is written or spoken to favour or not favour a particular social group (such as the upper, middle or low classes). In other words, whether or not there are words or expressions to boost the bourgeoisie or not to favour the proletariat. In this quest about the place of language in the process of exacerbating or reducing poverty, there is the responsibility of the academicians of language and amongst them are grammarians, those who wrote grammars we use today. They may or may not have some legacies in terms of poverty relief. We can question their works. Does grammar reinforce division amongst social classes or bridges divisions? Is the way poor people use the language compared to the conventional grammar acceptable or they have to do it in a particular manner or format in order to move out of poverty? For example, what are the legacies of Louis Maigret and Maurice Grevisse (French language grammarians) in terms of poverty relief? Did their grammar works deepen poverty or their writings have nothing to do with poverty whether at home or overseas (in Africa for example)? This is the investigation under this article. Poverty reduction is measured by both quantitative (numbers) and qualitative (words) indicators. Because we are dealing with language, we are going to use qualitative (words) indicators in this 59th Issue to express poverty and poverty relief. In the language we use, words joined up to make a sentence and a paragraph, can help to understand poverty and to reduce it. For example, we can use the following qualitative data. Without thoroughly defining modern foreign languages, let simply say that they are the languages studied for cultural or linguistic values for day-to-day communication. Examples of these languages include Latin, French, Spanish and German. Being able to learn and communicate in these languages can help you to a window of opportunities in ever growing globalised world. This can help to reduce poverty linked to the lack of opportunities for work, for generating income, for educating etc. This topic of modern foreign languages raises the need to question the relationship between poor people and modern foreign languages. One may ask how many people from poor background manage to overcome their conditions because they were able to speak and write in another language. It is a difficult question to answer but not impossible. So, a good command of a foreign language can lead to a better lifeline of income earning opportunity and happiness. Their benefits go beyond the function of providing opportunity to resolve unemployment. They can help to connect and interact globally through the social media networks. In this respect, the understanding of foreign language can be a tool for poverty relief and sustainable development. Without being judgemental of any educational systems, it is acceptable to argue that the study of languages in educational systems should not be solely based on meeting the general needs of the society. Language programmes should as well be conceived in the way to respond to the needs of the poor in order to address poverty linked to poor language and inadequate linguistic skills. This raises the issue of the usefulness of any language programme in terms of poverty relief. Educational systems forge pupils’ and students’ minds and intellectual constructs in terms of their perception of poverty and the language they may use to deal with this reality. A language programme within these systems helps to develop people’s mind sets in terms of the languages and concepts they will use to apprehend poverty and poverty relief. However, educational systems are not the only place that forge people’s mind, other factors have to be taken into account as well. This means that the lack of understanding and action against poverty by educated or uneducated people should not be put a blame on only their educational credentials or past. An investigation of their background should be included as well. Every time people in need get an opportunity to learn and understand a language and be able to write it (its orthography), this can enable them to communicate their needs of poverty relief and possibly to get the relief they deserve. This can change and save their lives. Mastering a language, for disadvantaged people, can provide further benefits such as get integrated, have a life and being included in the mainstream of the society they live in. An experience of using a language project to empower people in need is CENFACS’ deBASICS project. deBASICS stands for Basic Skills Development. This was a language and basic skills project set up by CENFACS to help reduce language and communications poverty amongst the French-speaking families through the provision and development of literacy and English language skills while seeking to enhance other life-sustaining skills by working together with them to integrate them in the part of the UK society where they live in so that they become economically active. For more on deBASICS, please contact CENFACS. You can support CENFACS to deliver for educationally and digitally needy children in Africa an e-learning project of literacy to help reduce poverty there. LePR aims at reducing literacy poverty and improving digital literacy skills via e-learning technologies with knock-on effects on other types of poverty that these poor people experience in their daily life. They will be children and youth people struggling in literacy, those who do not have schooling opportunity, those living in remote areas without educational opportunity, those living in the vicinity of war and environmental disasters and who lost the opportunity to learn and develop literacy skills. General literacy rates across Africa sometimes look good. However, there are many pockets or places where literacy is still a challenging issue. The LePR will be implemented in parts of Africa that are poor and without access to e-learning opportunity to build and develop literacy capacity and skills. Working together with our Africa-based colleagues, we intend to develop e-learning apps or to purchase apps from the market that can be customised to meet beneficiaries’ local needs. We are also planning to provide tablets to schools and local communities and set up community literacy e-learning hubs or points. The starting month of this project will be September 2018. To get a copy of the 59th Issue of FACS and or to post your comments about it, use any Comments sections of this site to do it.